WoodhouseClothing.com was born in 1975; named to conjure up an era when quality and personal service were paramount and to this day the company endeavors to uphold this philosophy. Woodhouse was one of the few independent companies that focused on a luxury brand offer together with highly trained staff, and from this conception, Woodhouse has been an editor of fashion, presenting a coherent style and gaining an excellent reputation in the development of brands which has resulted in a discerning and loyal customer base. Get your look for less with discounts and deals from VoucherGurus.co.uk. Check out WoodhouseClothing.com's selection of Armani, now starting from just £64.95. Woodhouse Clothing is offering killer savings of up to 70% off select items. Follow link to start saving now! Act now for the beat selection in the Sale Section at Woodhouseclothing.com. We saw over 10 pages of smart sale items, many discounted over 40%. Click link to see what we mean. Select Sale Denim is Discounted up to 60% at Woodhouseclothing.com. 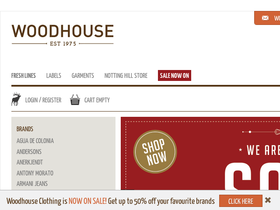 Just use this voucher code on WoodHouseClothing.com and you'll get Free delivery on your order of £50+. Save 15% off Replay and Victorinox stock at WoodHouse with this voucher code.